Round and round we went. First went to buy some fresh fishballs and Yong Tau Foo. Then time to find food. What to eat...where to eat.... Don't really know.. google and saw that mostly recommend a restaurant but when we pass by..there were so many people inside and outside waiting. 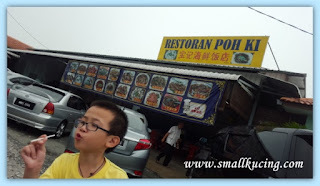 Surely that is not the only restaurant with good food there gua? There were plenty of restaurant along the main road. So we just tembak one restaurant la...Saw this Restaurant Poh Ki. Attracted by the banner. Got photos of food. Easier for us to order as we just need to point, ask and order as some village style restaurant doesn't have proper Menu. Eeny, meeny, miny, moe ... which shall it be? Mamarazzi choose this.....shark meat with preserved radish. Taste pretty good. Just like normal fish meat. 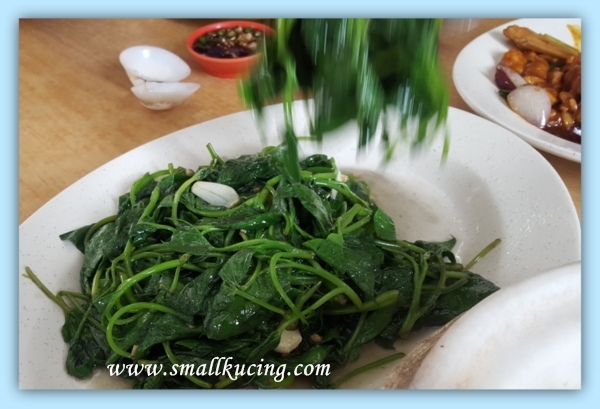 Also Tofu ..with mui choy...alamak....didn't realised dishes also consist of preserved/salted vege. Nevertheless, it was appetising. 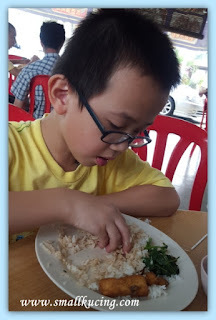 Again my "angin datang"...wanna eat with hands pulak. Managed to eat 2 plates of rice...shocking Ah Ma who kept saying I can't finish la. Currently, am at Jughead Jones stage and follows Mamarazzi's genes. I can eat and eat and eat but don't grow fat. Mamarazzi is sure lucky to have a kid like me. When am hungry, I will look for food to eat and when am full, i will stop eating. Since birth, no need to worry about me not eating or eating too much. How much was the bill? Surprisingly the total bill was quite cheap reasonable. 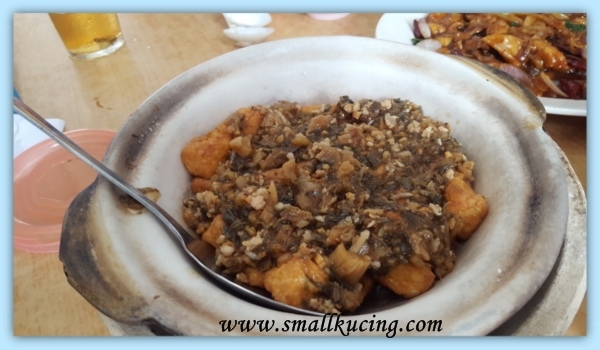 All in..inclusive of Chinese tea only comes up to around RM50plus. La la la lala!!! I like!!! So lucky you and your mamma - I smell food, already grow fat. Sobssssss!!!!! Ya, ur mama is sure lucky to have a kid like you, lil kitten ... smiles ... Love, cat. wah, all places also packed with people?? was it because of too many people or there are actually too few nice restaurant around the area?? 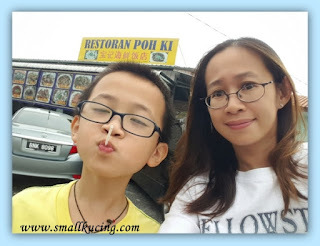 haha.. luckily Mamarazzi was able to find one to makan..
hahaha small ones la...saw being sold in Pasar before. But heard it's not easy to cook coz the meat is tough wor. But the ones we had was good. Not tough at all. I don't know if it's coz I've been here before (if it was it must have been with better half's brother coz he likes to go to far away places to eat) or coz the sign board is very common. Haha. ya lor...sometimes to us also same... the signboard looks familiar. Shark meat? Can eat one meh? Nice ah? If nice I think we should promote it. I think the reason people ban shark fin is because people cut off the fin but throw the sharks back to the sea to die a slow and painful death. If we eat the entire shark and kill them quickly rather than letting it die slowly, those hippies would shut up. After all, killing a shark is not much different compared to killing a cow. Same ending a life. 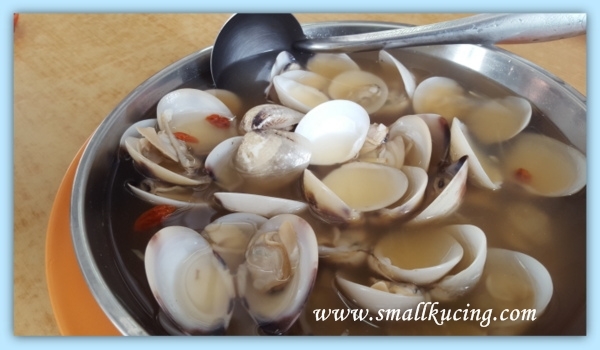 Yes can eat leh... but these are smaller sized shark la...i think la.... heard that it is difficult to cook shark meat coz its meat is tough. Have a lot of "kungfu" baru can cook it well wor. Not sure. Saw shark being sold in pasar before but Mamarazzi never tried it. I also love lala, but not many place can eat. When I was young I had genes like yours, whatever I eat also cannot put on weight. But now old liao, the genes decided to change, now I eat less also put one weight. The price there is very cheap. Good food I must say. Your little can eat and its okay as long as he is healthy. Good food and nice price too! Bookmark this!! Small Kucing got good genes from Mamarazzi, can eat and eat but not grow fat. Very good. 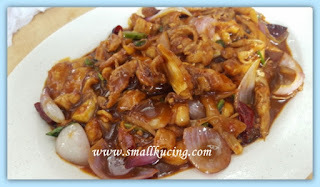 Last time I ate at a stall selling deep fried shark meat before - taste very nice. I will always envy people who have kids who can look for food by themselves, eat by themselves and stop by themselves! But you funny la, if eat so much why not become fatter a bit?? Whoaa! I am shocked to hear they serve sharks meat. I think I have eaten once when I was young and forgotten how they tasted. I still eat sharkfins soup because they are all faked ones as proudly announced by the chefs during the big wedding banquets.